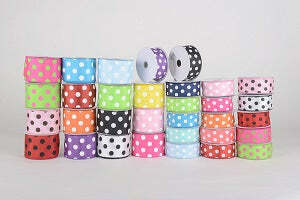 Satin polka dot ribbon wired gives a soft and smooth touch to your decorations. Due to its attractive colors, your ribbon makes special moments pleasant. It's is used in hairstyle, decorations, party and event decorations, hair bows and much more. One of the most pleasant combinations is polka dots and stripes that can use to create a fantastic wedding design. The traditional white and ivory weddings are lovely, but it can be fun to mix it up with bright colors and lively patterns. All bulk and wholesale customers are capable of buying from our online store at affordable pricing without least necessities!